The park is in the Virunga Mountains and in the Albertine Rift montane forests ecoregion. Totaling about 33.7 square kilometers, it is the smallest of Uganda’s national parks. The park is about 15 kilometers (9.3 mi), by road, south of the town of Kisoro and approximately 55 kilometers (34 mi), by road, west of Kabale, the largest city in the sub-region. The park is located within Bufumbira County of the Kisoro District. MGNP includes three of the eight Virunga Mountains volcanoes: Mount Muhabura, Mount Gahinga, and Mount Sabyinyo. These dormant volcanoes are international mountains, with Muhabura and Gahinga on the Uganda/Rwanda border, and Sabyinyo a tripoint on the Uganda/Rwanda/Democratic Republic of the Congo (DRC) borders. MGNP and the Bwindi Impenetrable National Park are the only parks within Uganda that protect habitat for the mountain gorilla, an IUCN Red List endangered species. MGNP’s protected area is contiguous with the Volcanoes National Park in Rwanda and Virunga National Park in the DRC. These parks form the 434 square kilometers Virunga Conservation Area for mountain gorilla habitat. MGNP protects about 8 percent of the total VCA. MGNP also protects tropical moist broadleaf forests of the Afromontane Albertine Rift montane forests ecoregion. The park experiences two wet rainy seasons: February to May; and September to December. The average amount of monthly rainfall varies from 250 millimeters (9.8 in) in October to 10 millimeters (0.39 in) in July. The park was established in 1991. On 7 November 2013, the M23 Movement, a Congolese rebel group, surrendered in the park after being defeated by the Congolese Army in the M23 rebellion. 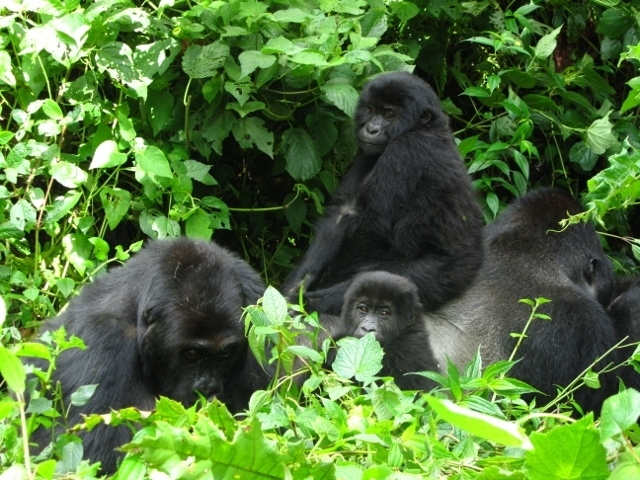 Mgahinga Gorilla National Park, though unpopular, is the second habitat of the mountain gorilla in Uganda after Bwindi Impenetrable National Park. Mgahinga has only one habituated gorilla family, Nyakagezi group. A maximum of 8 people are allowed to see the great apes in a day. Gorilla tourism in Mgahinga is developing steadily over the past five years especially with additions of new tourist activities such as the Batwa Trail and Golden Monkey trekking. Accommodation in Mgahinga is provided at Amajambere Iwacu Community Camp (budget accommodation) and Mount Gahinga Lodge. The later is a mid-range lodge run by Volcanoes Safaris. A number of tour operators work closely with the Uganda Wildlife Authority to reserve guided treks in Mgahinga Gorilla National Park. The common activities in the park are gorilla tracking, Sabyinyo volcano hike, golden monkey tracking and the Batwa Trail. Local tour operators such as Bamboo Ecotours based in the nearby Kisoro town provide needed services like transport to clients interested in visiting Mgahinga.